Two good Samaritans, who rescued a man whose car toppled into a rushing creek in early February, were honored by the Contra Costa County Board of Supervisors for their heroic actions. “Here is the true definition of a hero: ordinary people doing extraordinary things, not even thinking for their well-being," Supervisor Catharine Anderson, who put the proclamation on a Tuesday meeting's agenda, said of Clayton Wiedemann and Dan Rich. On Feb. 8, Wiedemann and Rich were nearby when the driver of a 1996 Toyota Corrola lost control of his car, slid off a rain-slicked road and plunged into a swollen Livermore creek. The duo grabbed a pickaxe, jumped into the water and smashed the overturned vehicle's window to free the 20-year-old man. "You could hear a window implode inside and I just started grabbing everything we could," Rich said at the time. "I guess one of the things I grabbed was him. It all happened so fast, he ended up on the bank before we knew it." 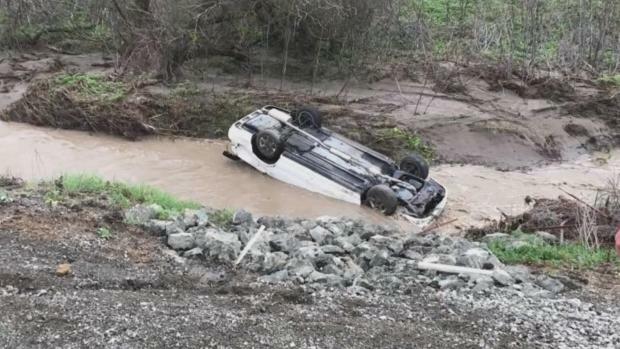 Two good Samaritans are being hailed as heroes for leaping into a rushing creek near Livermore on Tuesday and plucking out a young driver trapped inside an overturned car. Jodi Hernandez reports. California Highway Patrol officers credited the two men with saving the victim’s life. But Rich and Wiedemann denied being "heroes." Work commitments prevented the duo from attending Tuesday's meeting. Instead, the proclamation was presented to Sandy Wiedemann, Clayton Wiedemann’s aunt.